The Google Fiber Internet service was launched in 2010, in Kansas City. Fiber internet service from Google promised to drastically speed up internet access across the USA. In cities where Google Fiber is available, Google internet service is consistently faster (and cheaper) than other providers. It's no surprise incumbent ISPs have had trouble keeping up. Google Fiber's parent company, Alphabet Inc. has great investment power and influence. (At time of writing, Alphabet Inc. has a market capitalization of $648 billion. This is approximately 3 times more than AT&T and nearly 6 times that of Comcast). Still, even Google has experienced set backs expanding it's ISP business. In areas such as San Francisco, Google's fiber business acquired Webpass. This was a move away from a pure fiber solution, to wireless internet service, using existing infrastructure. 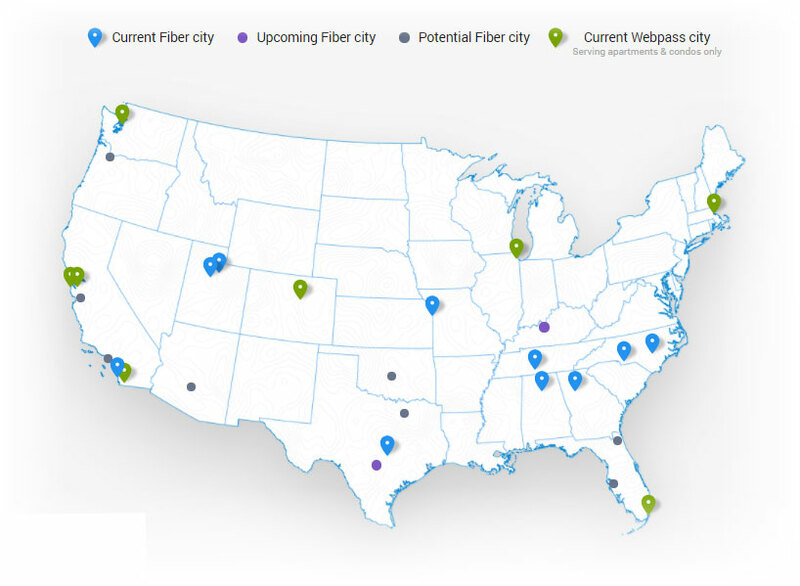 Google rollout of fiber to new cities is currently paused, due to a business restructure and other reasons. It has succeeded in pushing competitors to improve internet service offerings. Google internet service does offer consumers more choice and value for money, where it is available. Where Did Google Fiber Start? Why Did Google Fiber acquire Webpass? Google Fiber is a high-speed fiber internet connection, provided by Google. Service offers upload and download speeds of up to 1000 megabits per second. This is over 50 times the average internet speed in the USA as of Q1 of 2017 figures, based on fixed internet connections. As well as high-speed internet, TV is also available through the service with over 220 channels. This includes HD channels and on-demand TV shows and movies. Since 2015, Google Fiber has been owned by multi-national parent organization, Alphabet Inc.
Hey, it’s Jimmy with Jim’s Review Room. So what is Google Fiber? For the average consumer, it’s crazy fast, up to one gigabit of download and upload internet speeds. In America at the time of this video, there are only nine cities in the entire US that has Google Fiber up and running. Now there are four other cities that are currently up and coming per the Google Map here and another select few, 11 specifically that are potential candidates for the expansion. So it’s a humbling experience for me considering I’m getting to try this out at such an early stage as this will be the future of our internet. So what about pricing? I will place the packages on your screen right now. I’m personally paying these $70 a month option here and I won’t get into details about that TV bundle. But for those who think that maybe they don’t need a gig of speed here, there’s Fiber 100, which is still phenomenal as you do get 100 down, but more importantly 100 up. That package is $50 a month. Now comparing to the world, listening to my viewers out there, those – let’s say they’re for like the Middle East or India in general. They are paying very high prices for slow speeds. On the other hand, my viewers from Japan and other various parts of Europe that actually has fiber, it’s actually cheaper than what the US is offering right now. If you guys can, in the comments section below, let me know what country you’re from, how much you’re paying and how fast are your speeds. This will be very interesting to see and compare it basically. Now with that being said, besides the crazy speeds which I will show later, not many are aware of the benefits fiber has to offer. Now when they installed this I had taken some photos here during the progress. They explained fiber cables run directly from the hub to my street here. The wire then continues into this side of my house, into this little box here that you can see. Nothing too fancy. But I just want to show you guys what’s inside out of curiosity here. The wire wraps around my house and then enters into my living room on the side. So from the hub, the streets, all the way inside my home, the data is completely transferred by light and because it’s fiber, there’s no electrical interference that we see commonly on traditional metal wiring. Now only from the wall to the provided modem, through my Cat5e, into my computer is where any electrical interference may or can occur. Now great for businesses in the city, of corporate buildings where there are tons of wireless signals, other electrical interferences. Fiber cables are generally immune to them. Now let’s get into the speed test here. Here’s a quick video as proof this stuff is nuts and I will fast forward to the upload speeds, in which I will be more particularly interested in. Now as you can see, hitting over 900 on both ends with a two-millisecond ping. It’s insane. But let’s do some real world tests. Clicking on a YouTube video 4k video loads practically instantly with zero buffer time. Now if you click on an un-buffered area, just skip forward. There is a slight delay but seriously minimal. Netflix is particularly or practically the same with instant video startups here and a slight or minor buffer if you do skip ahead. Now let’s jump over to downloading games from Steam, downloading H1Z1, a file that’s roughly 6.5 gigs had taken a little over four minutes to do. Getting on PlayStation 4 and I think PlayStation 4 owners can attest that download speeds are never near what you’re getting from your internet service providers. Doing an internet speed test, it’s good compared to the past but nothing close to what fiber is offering. I also had the chance to download Call of Duty: Infinite Warfare during their beta last weekend. If I recall, it was about maybe 15 gigs or so and they had taken about two hours to do. But of course when playing games even with a 20-megabit download speed, games usually run perfectly fine. So overall, everyday tests like webpage loading. It’s a similar experience, nothing too crazy. 4k and Netflix really shines with near instant, sometimes instant results. Downloading is indeed faster. But depending on their servers, from Steam or whoever it may be, it might not allow you to download as fast as you would expect. Now my reasoning behind that, the average speed in the world is nowhere close to what fiber is offering. So I’m sure corporate server owners haven’t caught up to fiber speeds, which is very much understandable. So last, as I stated, I’m actually more interested in upload speeds. That’s the biggest difference coming from two to ten megabits upload from my previous provider and now we’re jumping to 900 megabits in upload speeds. Now first, which is my full time job uploading YouTube videos, in this instance, a huge difference was noticed. By the time Google Fiber finished with that same 800-megabyte file, Time Warner’s 10 megabit upload was still at around 13 percent. For a stream, very minor pixilation during fast-moving scenes but overall a great image. Sixty frames per second, full HD and I have my laptop and iPad viewing the stream at the same time in the house. Their internet simply didn’t slow down. So with all that being said, I do see some of the benefits at the moment now and it can be overkill for some things today. But I’m excited to see what the future holds and I’m certain streaming 4K or sending massive amounts of data within a business to cloud servers, through simply offering more reliable internet in various parts of the world, that’s just some of the potential that Google Fiber or fiber internet in general has to offer. So that’s it for this video. Nothing too detailed or scientific but a glimpse into what you might experience when fiber comes into your area. Google Fiber was launched in 2010 in Kansas City. Coverage included 20 Kansas City suburbs, within the first three years of operation. The service expanded into Austin, Texas, and Provo, Utah in 2013. Service became available in Atlanta, Charlotte, the Raleigh – Durham Research Triangle, Nashville, and Salt Lake City during 2014 and 2015. Google Fiber is coming to Kansas City and we’re bringing an entirely new ultra high-speed network. To install this new technology in your home, we’re building our network from the ground up, stringing fiber optic cables through your neighborhood. We start by connecting your home to one of these fiber optic cables, which contains a glass thread, capable of transmitting gigabit internet speeds. On the day of your installation, we plan to arrive right at the start of your appointment window. So we’re ready to make the most of your time. When we arrive, we will talk you through the process and answer all of your questions. To get connected, we will begin by bringing fiber into your home. The fiber jack converts the fiber optic signal into data your computer can understand. Your home is ready to get online once we plug in the network box, a Google router designed to provide gigabit speeds and built-in Wi-Fi. TV subscribers also get a Google DVR called the Storage Box and a Google Fiber TV box for each TV you choose to connect. To connect each TV, we use your existing cable wiring or installs new cables if needed. Once we’ve set everything up, we will show you some of the many features of the Google Fiber TV and your new remote control, the Nexus 7 tablet. Then we’re off. So you can start enjoying Google Fiber. How Much Does Google Fiber Cost? Google Fiber residential plans cost between $50 and $160 per month, depending on the plan that is chosen. Add-on Fiber Phone service is available for an additional $10 a month. Streaming services such as Spotify Premium can be added for $15 a month. Where available for qualified businesses, service costs between $70 - $250 per month. What Google Fiber Plans Are Available? Fiber 100 + TV – up to 100 Mbps upload and download speeds suitable for 5 or more devices, 220+ TV channels, and 7,500+ on-demand shows and movies ($140 per month). Fiber 1000 + TV – up to 1000 Mpbs upload and download speeds suitable for 10 or more devices, 220+ TV channels, and 7,500+ on-demand shows and movies ($160 per month). All plans do not have data caps or annual contracts. Connections come with a network box with no rental fee. TV plans come with a TV box with built-in Google Cast and no rental fee. All Fiber 1000 plans also come with 1 free terabyte of Google cloud storage. All service fees are plus taxes. New service requires a $10 sign up deposit. There may be a one-time $300 fiber construction fee, depending on when you subscribe to service. With basic internet plans, this fee can be paid over 12 months in $25 instalments. The $300 construction fee can be waived if you sign up for 1 year, on certain fiber plans. More info on fees and equipment replacement charges can be found here. TV services are available as an optional extra with a Google Fiber plan. Users choosing a TV plan will receive a TV box with HD DVR that records 8 shows at once and built-in Google Cast. Additional TV boxes can be added for $10 a month each. Plans range from 15 to over 220 channels with on-demand TV shows and movies also available. The TV software uses Smart Search and Recommendations to recognize your favorite programs and suggest new ones. There’s also a Fiber TV app. This allows you to control your TV from your smartphone or tablet and watch certain channels from your mobile device. Google Fiber is already planned for expansion into Louisville, Kentucky, and San Antonio, Texas. Webpass is a Wireless Internet Service Provider that’s been in business since 2003. Webpass uses wireless tech to provide high speed internet connections to users originally in San Francisco. It has since expanded to San Diego, Miami, Chicago, Boston, and Denver. Webpass was acquired by Google Fiber in June 2016. This was seen as a move to grow service faster. Utilizing existing wireless infrastructure for last mile connectivity, (instead of fiber optic cables), is faster to setup and more cost effective. Google Fiber advertises speeds of up to 1000 Mbps for both upload and download, which is up to 50 times faster than the average internet speed in South Korea, a leader in average internet speeds. Actual internet speed you get from Google's Fiber service depends on; the plan selected, hardware used to access the internet and how many people are sharing the connection. Speedtest.net measures actual user internet speeds. It gives Google's internet service a speed score between 170.10 and 224, depending on area. Speed Score is calculated from upload and download speeds combined in a weighted average. Some other ISPs including Rocket Fiber, and AT&T Internet have also achieved scores of over 200 in certain areas. The fastest average download speed for Google Fiber is 131.39 Mbps, and the fastest average upload speed is 117.44 Mbps, both in Kansas City. Google also provides it's own speed test tool for customers which can be found here; http://speed.googlefiber.net/. Google Fiber offers 24/7 telephone support, email support, and live chat. There’s also a comprehensive frequently asked questions page. Fiber Internet from Google is currently available in 15 states (some via wireless provider - Webpass). Additional cities are planned for expansion in the future.You can see where Google Fiber and Webpass is available in the map below, as well as the planned and potential cities for future roll out.